If you have kids or teach Sunday School, then you likely recognize a Vacation Bible School (VBS) title when you hear one. Our church is gearing up for VBS. Parents started to sign their children up at coffee hour yesterday. 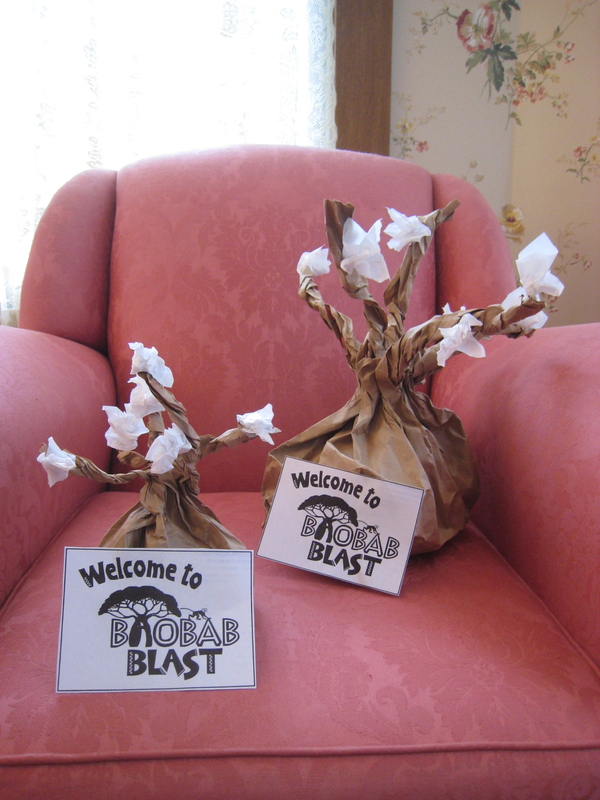 Since I volunteered myself to choose/gather the VBS crafts this year I was asked to supply a faux baobab tree to decorate the sign-up area and get people in the mood. My excuse? Other than the fact that I didn’t write it down? I’ve been organizing a coed high school volleyball team car wash for next Saturday and canning excursion for next Sunday, among other things. You know the drill, I’m sure. So I really forgot since the older I get the less I remember. That is, until someone walked up to me at coffee hour yesterday and reminded me. I was proud of me though. I rolled my eyes, slapped my forehead and admitted that I plain forgot. The person seemed puzzled by my straightforwardness and took a while to let it go. Funny that. 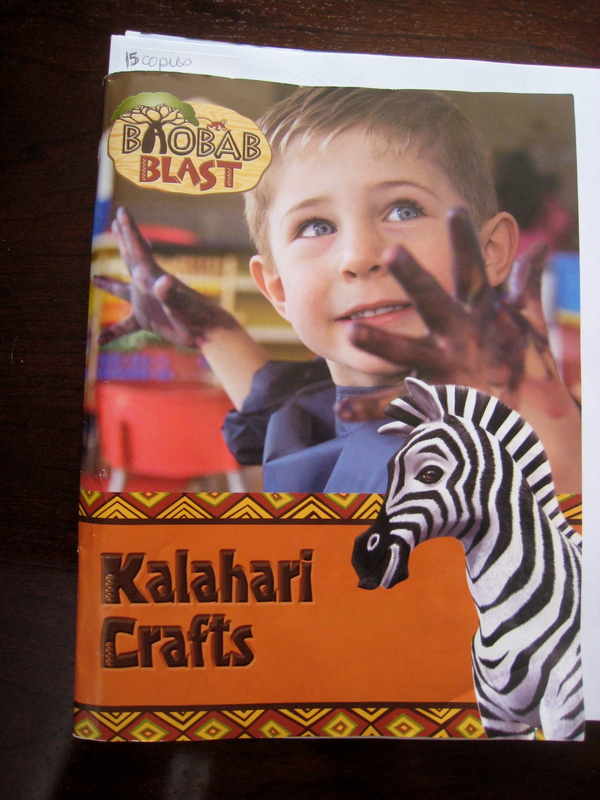 Anyway, I volunteered to choose age-appropriate crafts from the Kalahari Crafts planning book, test out the crafts to make sure they will turn out okay when the kids do them, and gather/purchase the supplies. Some cool projects in this VBS craft book. Choosing the crafts for the five-day event was easy. I loved to do crafts with my kids Max and Tory when they were younger. And I like to think I’m pretty crafty. Azalea bushes? I think NOT! And yes, I will take them to church on Sunday so they can generate interest around the VBS sign-up sheet. Actually, I’ll take them in later this week since I’ll be with the volleyball team next weekend. Part of my effort is to supply the craft teacher with explanations that will enhance the lesson. I admit I didn’t know much about baobab trees until my friend Google and I got together this morning. It’s good to have friends. 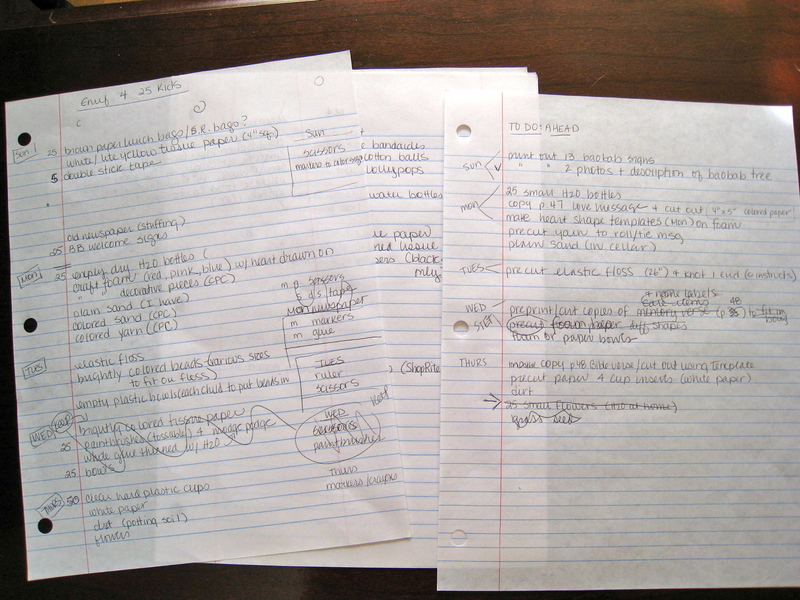 I try to write everything down. . .or else I forget to do it. Can everyone say, "faux baobab trees?" To prep for anything that involves kids, crafts and supplies I make lists. Consult the lists and check tasks off my lists as I do them. Again, it’s all pretty familiar to you, right? 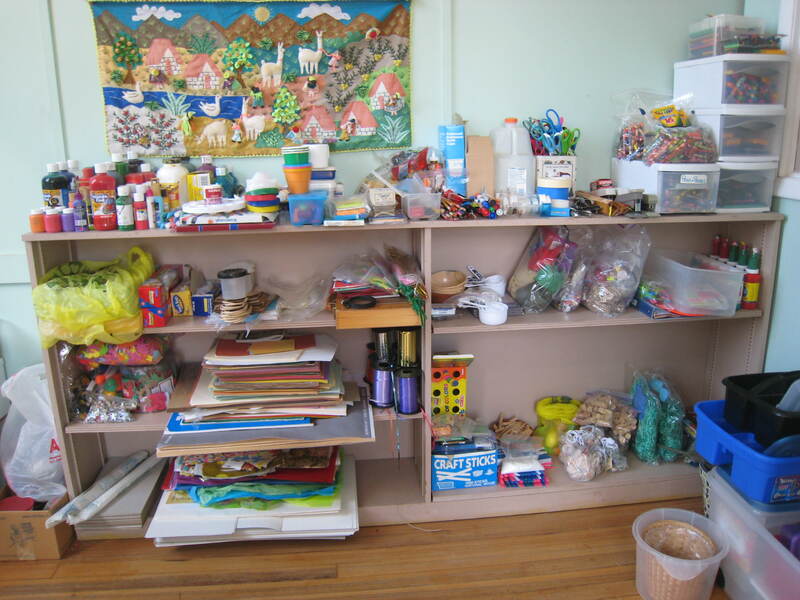 So then it would also be pretty familiar to you if I told you that I returned to the Sunday School supply area today and spend another 2 ½ hours finishing the sorting, discarding, and grouping like craft items and stuff together that I started on Mother’s Day? And that I was too tired to them pull the supplies I need? And that I’ll return to the supply area later in the week to actually gather my supplies since I now know where to find them? Yes! I knew you’d understand! "After." We have enough crayons to draw many circles around the equator! Next up is consulting with those in charge to see how they’d like the sorted supplies stored. I’ll be gathering the supplies to make a Love Message in a Bottle, a Beaded Friend Anklet, a Tissue-Paper Decorated Bowl and a Double-Cup Message Insert. 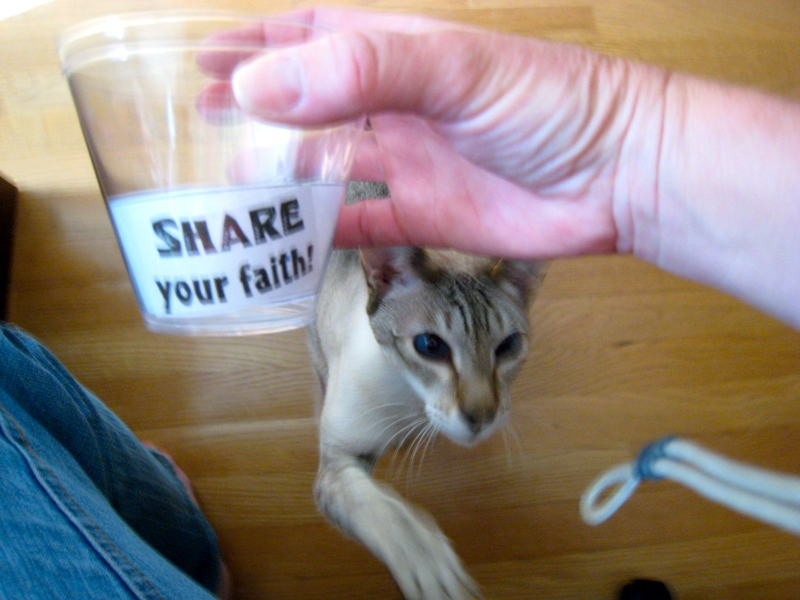 Our Siamese T-Rex attempting to grab my camera strap while I attempt to take a photo of the beginnings of another VBS craft.